Are 1st goal/try scorer refunds worth it? As the new NRL and AFL season starts, the bookies are going to be doing all they can to entice you back to bet with them. Sportingbet have a refund if your team scores over 12 points but loses and sportsbet have the same deal but with 18 points. These offers do offer value and I happily take them up when I can. By doing a tiny bit of research you can figure out the average points a team scored per game last season, how strong the other teams defense was and how they performed against each other last year. 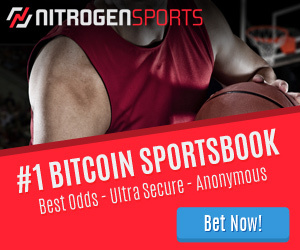 Taking these bets also shouldn’t lead to your account being closed. These offers will only be around for the first week or two so take the few minutes it takes to do the research and make some profit. You can even back and lay the same bet at Betfair for an easy guaranteed profit. Onto the offers these bookies will have over the full season. The ones that seem great. These include some of the images below. Tatts have a refund on your 1st try scorer bet if the number 3 from either team scores a try. 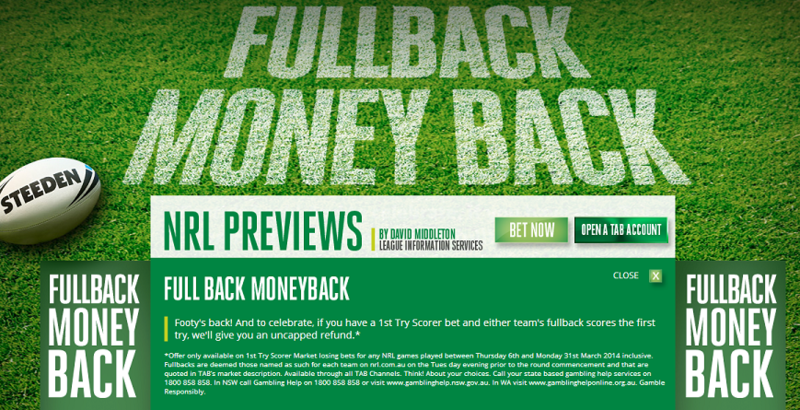 TAB refunds if the fullback scores the first try. The bookies want you to place these bets so badly, and you need to ask yourself why? The reason is simple. A H2H market is usually $1.90 on each team if they are fairly matched. This is a 105% market. The bookmaker will make 5% on average on this bet. So every $100 you bet they will pocket $5. Now onto the shocking truth about 1st Try scorer and 1st Goal scorer markets. The book on these are 150%. I’ll repeat that again, 150%. What that means is that for every $100 you bet on these markets, the bookmaker is making $50 on average from you. No wonder they will do anything to get you to bet these. That is the same as changing the odds on those evenly matched teams from $1.90 each to $1.34 each. Would you bet with them if that was the case? No F^*^en way. The books use your lack of maths knowledge to screw you over royally. No amount of refunds can overcome the massive head-start these books have given themselves. If you’re a smart gambler then you now know to stay well clear of these type of offers. Where can aussies bet when Pinnacle & others leave our shores? What bookies do you recommend? I mean, we all know about Pinnacle or Betfair but where (and how many if you want to find the bests odds) would you put your money in? Sadly the choices are very limited if your going to make a profit long term. Open accounts everywhere but very quickly you will be limited at every Australian bookie if you look like making a profit. 90% of my bets are placed at Pinnacle, BF, Matchbook, SBObet. Thx mate. This is what i thought. I will only add 5Dimes to your selection. Good luck! Steve, how do you manage to operate when traveling? I mean, as far as i know, many countries have restrictions as US. Logmein, vpn, so on. In some countries I don’t bet at all even with these safeguards. Steve I’ve got a different opinion on the FTS bets in the NRL. I understand the maths of the market at 150% or more but that doesn’t necessarily mean you can’t find good value with individual players. I’ve made some money this year just backing wingers in the favourite teams. While the overall market is set at around 150% I think most bookies have the favored players (wingers who scores about 40% of FT) over their true odds and the outsider (forwards) way under their true odds. This leaves a situation where punters who have a good understanding of the market to achieve some value. Don’t think it’s a smart play just to avoid the markets altogether as you can find value in sections of the market. Interested in yours thoughts. Hey Peter, Yes, I wouldn’t argue with that. I’ve seen hundreds of ways people make money betting, and there’s no reason you couldn’t make money in this area as well. There very well might be a longshot/favorite bias in the odds. But 150% markets are still very very hard to beat. But just backing wingers in a favorite team doesn’t seem like a longterm winning system. Sadly it would take at least 1000 games (as the odds are so high) to come up with a statistically significant number to see if your hypothesis was true. Also with the specials, one bookmaker was paying out as a winner on both 1st and 2nd tryscorers. 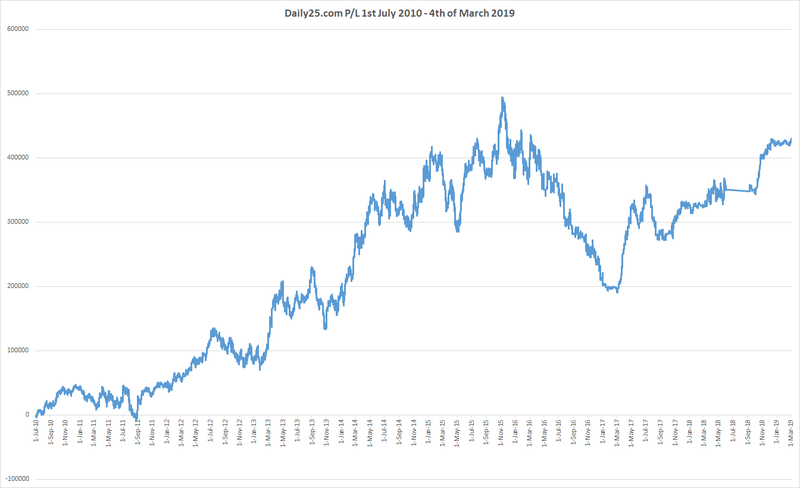 This gave you 2 opportunities to collect from the 150% market which I think means the market becomes 75% or there abouts giving the punter a chance to get real value. Thanks for your response.